"In the sweetness of friendship let there be laughter, and sharing of pleasures. For in the dew of little things the heart finds its morning and is refreshed." ~ Kahlil Gibran"
When I was growing up in the 50's there seemed to be days to do different aspects of housework. Of course, most women stayed at home as mothers and homemakers. I remember there being certain days for washing clothes, another day for all that ironing. I never understood why you bother to iron sheets?! But with the linen fabric they did wrinkle a lot. Anybody remember the sprinkler bottle that you moistened clothes with before ironing? Many people had needlework kitchen towels and we had a set of 7, one for each day, stating what was to be done on that day. I thought that was pretty cool. I actually have one of those towels. My mom did needlework so I don't know if she did them or not. Mending day ... I bet some younger folks would ask what that was. These days if something gets a hole in it, it just gets tossed out and a new item purchased. A very different lifestyle and thought process from 5 decades ago. I grew up in Pennsylvania Dutch Country so things may have stayed simpler there than many places in the country due to the influence of the Amish and Mennonites. Birds - The big Virginia snow storm brought a lot of birds in before, during and after. Let me thank all of you who emailed concerned whether we were okay. Sweet! :-) Flocks of Juncos, White-throated Sparrows, American Goldfinch and House Finches increased greatly. They love to catch what the birds drop from the feeder. The goldfinches enjoy the thistle sock with thistle seed and just cover it with as many that can fit on. Yesterday a White-throated Sparrow took a bath in the bird bath on the deck. Our Carolina Wrens enjoy themselves without much social environment between other species. They toss a lot of the seed on the ground from the feeders digging through to find a bug. The White-breasted Nuthatch comes to grab some suet and seeds. They are so much fun to watch since they always go down the tree from above, rather than moving up. The Eastern Bluebird has been a frequent visitor to the suet feeders. We usually put mealworms out, but as it was so warm through November and December I never got them ordered, so the suet is making them happy. the heaviest seed they can find, taking it to the holly tree at our breakfast room window, placing it between their feet and hammering the seed out of the shell. These birds have no similarity, yet they are of the same species. They seem to enjoy being with each other. Never a tussle with those guys. 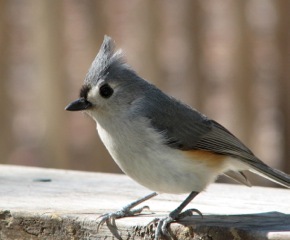 This morning when I woke up I heard the Tufted Titmouse singing his Spring song. Our 5 species of woodpeckers along with the Sapsucker and Northern Flicker were busy at the suet cakes. I heard somebody drilling a nest in one of the dead trees the other day. Couldn't find him with the sun shining in my eyes. It's about time for them to nest. The Mourning Doves and Cardinals seemed to enjoy eating cracked corn, sunflower seeds or thistle. Our American Crows enjoy whatever is left over, especially the corn. Happy to eat up under the bush where Randal tosses a mixture of things. Right now the Crows are defending our back woods since I hear the Red-shouldered Hawk squawking back there a bit ago. Our small flock of crows really earn their keep. What a delightful array of entertainment. We used to go to the theater for a musical or a symphony, but they don't compare with the sounds of nature in our own backyard. 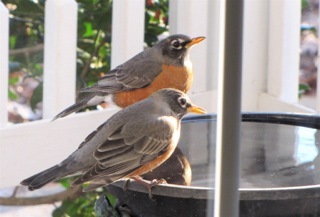 Yesterday we had our third flock of American Robins pass through. They come every year for the holly berries, but yesterday being as warm as it was, I guess the worms were coming up to check it out. The robins didn't bother with the trees at all. They were all over the ground scratching and yanking. Can't wait for that early Spring to arrive. And now ... we're having some wonderful warm weather again. I sat out on the deck in the chaise for 3-1/2 hours yesterday and today have been on the screened porch since 9 AM. Oh how heavenly this is for me! I know it won't last for long, so I'm taking every moment I can get. It's 64 degrees so far and only 11:45. Extravagant luxury! Great American Bird Count - This year's count will take place February 12-15. We enjoy this day so much. You count the types and numbers of birds you see and then enter them online. Check out the details. It helps ornithologists (bird science people) to determine the health of various species and new locations of them looking for habitat. We had a Bald Eagle fly in during the last five minutes of my count in 2011. Check out photo. That's a sweet memory! Check out video. Tidbit - Dining Experience - A Belgian restaurant “Le Petit Chef (Little Chef)” came up with an original way to entertain guests while waiting for their order by using an overhead projector on the ceiling. The animation is on the table and your plate. There is a small chef who appears on your plate ...watch what he does! It's certainly a fun way to wait for your meal to arrive but there's one last "visitor" to the plate that took my appetite away! View the video. Beautiful Bugs - Being a beneficial insect, gardeners love to see the half-inch Six-Spotted Tiger Beetle (Cicindela sexguttata) hanging around to help out with predators. 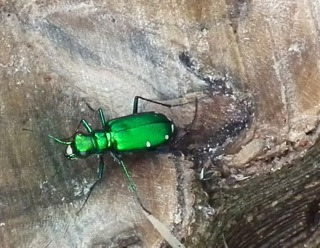 It's a member of the ground-beetle family feeding on other insects. Its powerful jaws make quick meals of the larval and adult stages of other arthropods. Each wing has 3-5 white spots on it. The color can also be blue. Isn't God a detail God? Even something seemingly unimportant as a bug gets His amazing artistic individuality. This critter can be found in the Eastern and Midwest part of the U.S. usually in or near woodsy areas. These beetles usually live alone and only get together to breed. They can be seen from April to August spending the day looking for food, then returning to their burrow (the same one they were a larva and pupa in) at night. Adults also spend Winter in their burrows. I just love the color and the detail of the white spots. It looks like he's got a white "nose" also and beautiful green legs. It's beyond my scope of reference to think about all the bugs in the world. How do you come up with a different design for all of them? From studies conducted by the Smithsonian Institution's Department of Entomology (bug department) in Latin American forest canopies alone estimate the number of living species of insects to be 30 million. That's simply too much for the mind to imagine. What about the rest of the world being added to it? 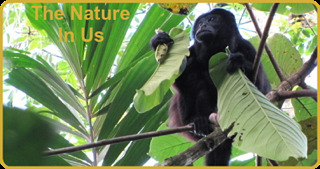 Tidbits - Patients Heal Faster With Nature Scenes - Did you know that patients who, in their room, have a view of nature recover faster than patients who don't? Living in and with nature can help you live longer. All other things being equal, patients with bedside windows looking out on leafy trees healed, on average, a day faster, needed significantly less pain medication and had fewer postsurgical complications than patients who instead saw a brick wall. 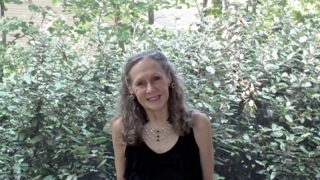 Just three to five minutes spent looking at views dominated by trees, flowers or water can begin to reduce anger, anxiety and pain and to induce relaxation, according to various studies of healthy people that measured physiological changes in blood pressure, muscle tension, or heart and brain electrical activity. At Uppsala University Hospital in Sweden randomly assigned 160 heart surgery patients in the intensive care unit to one of six conditions: simulated “window views” of a large nature photograph (an open, tree-lined stream or a shadowy forest scene); one of two abstract paintings; a white panel; or a blank wall. Surveys afterward confirmed that patients assigned the water and tree scene were less anxious and needed fewer doses of strong pain medicine than those who looked at the darker forest photograph, abstract art or no pictures at all. Read more fascinating research. Pets - Sometimes you just find the perfect end to a beginning bad news event. When an animal shelter received a severely injured kitten that needed a leg amputated, they didn't know how well it would go for the kitten finding a forever home. But two hours away there was a little girl that had her arm removed at 10 months old from cancer. As she got older, the family was looking for a pet that the child could grow up with. This 2-year old girl and the 3-legged kitten was a perfect match. The family and the recovering kitten were united and the child instantly noticed the common ground. Read more and watch the video. 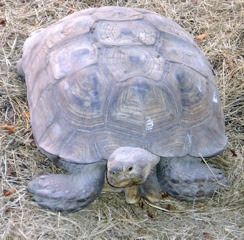 Critters - Tortoise Survives For 30 Years in Storage - It's no secret that tortoises are among the most resilient animals on Earth, perfectly adapted for life in natural environments that others would find inhospitable. But for one particularly tenacious pet tortoise, that hardy sense of survival allowed it to endure for decades in the most unnatural of places. Back in 1982, the Almeida Family was saddened to learn that their beloved pet, Manuela, a young red-footed tortoise, had gone missing. 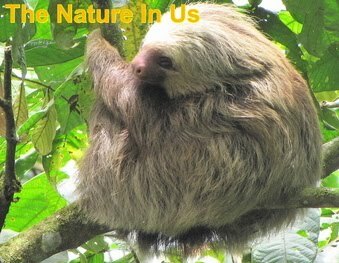 Their house was under renovation at the time, so the family just assumed that the slow-moving animal had slipped out through a gate left open by the construction crew -- disappearing into the forest near their home in Realengo, Brazil. But they couldn't have been more wrong. The true fate of their lost pet remained a mystery for the next 30 years. The family suspects she had been able to sustain herself grubbing on termites. And although she seemed to be surviving just fine in the dank confines of the storage room, Manuela is no doubt pleased (in her own tortoisy way) to be reunited with the family that had so long thought her gone forever. Good News - There's good news all around of people doing good things. Sadly the bad news rivals for the top position because it's simply what people pass along. My thought is that people keep passing on the bad news so they can get off the "icky" feeling it brings to their spirit and soul while it feeds into the brain. Maybe there's a feeling that the more people you tell, the more you can be relieved of the fear or fate of the bad news. Actually rehearsing the bad news anchors it deeper into the brain. Jump ahead many years later ... here I am with heart issues that don't allow me to bend over or have enough breath to accomplish any small portion of housework, so this wonderful man that I married is now taking care of it all ... and no, it's not detailed and organized or even clean. All major priorities in my life up till this season. He doesn't have brain problems, he just processes differently than me and considers priorities differently. He doesn't notice much, I notice everything down to a piece of hair on the bathroom floor. Marriage is a trip you take expecting an adventure - in other words, it's never what you thought it was going to be. That's what makes it an adventure. What makes it a beautiful memory is how much you choose to put into it. You can get upset that your spouse isn't like you (oh my! what kind of disaster would that make for a marriage), or you can ponder the depths of Jesus sacrifice for us and the Father's willingness to send His Son to die for us ... and that will increase your view or definition of mercy! So ... MERCY is my focus these days and just last night my husband commented that he's been very surprised by my lack of criticism (hmmm ... is that what it comes across as :-) and is enjoying the ride. He said he wasn't going to ask the question of me as to what I did with his wife. He was going to enjoy what he had before him at this time. This man has been a beacon of virtue taking over inside and outside housework and still working in our business. I can sit and fold towels or underwear, but the list of much else is very short. He seems to have been born for this caretaker role, although I definitely wasn't born for so many health problems, so I simply mean that he has a gift of serving. In these years he's never once complained, looked tired, or felt interrupted. Amazingly when I knock on the wall between the bedroom and the living room which means he needs to come to the bedroom, he'll express some sort of glee, like saying, "Housekeeping .... any towels today?" This man is many laughs shy of being a comedian so it's not his natural personality, but it certainly has been a light along the way .... and God is keeping His promise in Romans 8:28 to turn into good what the devil throws at us. I was never one to be able to receive. That's an issue on the table for 2016 also. I have a special friend who is going to help me make this happen. I'm so glad we have a most wonderful Papa that delights in turning us into the character of Christ so He can flow through us to others who need to see the unconditional and extravagant love of God. May You Be Blessed With a Purposeful Year! Don't Waste a Minute of It!